Definition at line 27 of file X86.h. Enumeration of all of the X86 CPUs supported by Clang. 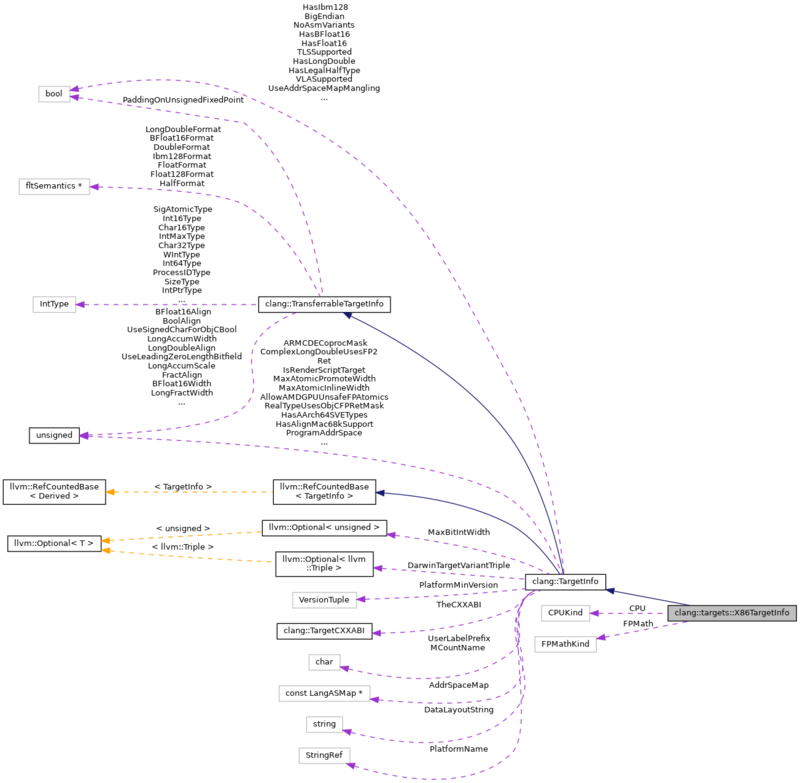 Each enumeration represents a particular CPU supported by Clang. These loosely correspond to the options passed to '-march' or '-mtune' flags. Definition at line 115 of file X86.h. Definition at line 125 of file X86.h. Definition at line 128 of file X86.h. A calling convention can either be accepted, produce a warning and be substituted with the default calling convention, or (someday) produce an error (such as using thiscall on a non-instance function). Reimplemented in clang::targets::WindowsX86_64TargetInfo, clang::targets::X86_64TargetInfo, and clang::targets::MCUX86_32TargetInfo. Definition at line 296 of file X86.h. References clang::CC_C, clang::CC_IntelOclBicc, clang::CC_OpenCLKernel, clang::CC_PreserveMost, clang::CC_Swift, clang::CC_X86FastCall, clang::CC_X86Pascal, clang::CC_X86RegCall, clang::CC_X86StdCall, clang::CC_X86ThisCall, and clang::CC_X86VectorCall. Check if the target supports CFProtection branch. Definition at line 184 of file X86.h. Definition at line 179 of file X86.h. Definition at line 1808 of file X86.cpp. Definition at line 1756 of file X86.cpp. Definition at line 1531 of file X86.cpp. Definition at line 1823 of file X86.cpp. Definition at line 271 of file X86.h. Definition at line 192 of file X86.h. Extracts a register from the passed constraint (if it is a single-register constraint) and the asm label expression related to a variable in the input or output list of an inline asm statement. This function is used by Sema in order to diagnose conflicts between the clobber list and the input/output lists. Definition at line 196 of file X86.h. Definition at line 1834 of file X86.cpp. Definition at line 1538 of file X86.cpp. Gets the default calling convention for the given target and declaration context. Definition at line 316 of file X86.h. Return the value for the C99 FLT_EVAL_METHOD macro. Definition at line 133 of file X86.h. Definition at line 1846 of file X86.cpp. Definition at line 140 of file X86.h. Definition at line 1842 of file X86.cpp. X86TargetInfo::getTargetDefines - Return the set of the X86-specific macro definitions for this particular subtarget. Reimplemented in clang::targets::CygwinX86_64TargetInfo, clang::targets::MicrosoftX86_64TargetInfo, clang::targets::RTEMSX86_32TargetInfo, clang::targets::MCUX86_32TargetInfo, clang::targets::HaikuX86_32TargetInfo, clang::targets::CygwinX86_32TargetInfo, clang::targets::MinGWX86_32TargetInfo, clang::targets::MicrosoftX86_32TargetInfo, clang::targets::OSTargetInfo< X86_64TargetInfo >, and clang::targets::OSTargetInfo< X86_32TargetInfo >. Definition at line 876 of file X86.cpp. handleTargetFeatures - Perform initialization based on the user configured set of features. Reimplemented in clang::targets::DarwinX86_64TargetInfo, and clang::targets::DarwinI386TargetInfo. Definition at line 704 of file X86.cpp. References hasFeature(), max(), and clang::DiagnosticsEngine::Report(). Definition at line 1376 of file X86.cpp. Controls if __builtin_longjmp / __builtin_setjmp can be lowered to llvm.eh.sjlj.longjmp / llvm.eh.sjlj.setjmp. Definition at line 320 of file X86.h. Definition at line 104 of file X86.cpp. Definition at line 282 of file X86.h. Determine whether this TargetInfo supports the given feature. Definition at line 1296 of file X86.cpp. Definition at line 1495 of file X86.cpp. Definition at line 288 of file X86.h. Enable or disable a specific target feature; the feature name must be valid. Definition at line 249 of file X86.h. Definition at line 596 of file X86.cpp. Use the specified unit for FP math. False on error (invalid unit name). Definition at line 92 of file X86.cpp. Definition at line 528 of file X86.cpp. Definition at line 449 of file X86.cpp. Definition at line 322 of file X86.h. Definition at line 561 of file X86.cpp. Check whether llvm intrinsics such as llvm.convert.to.fp16 should be used to convert to and from __fp16. FIXME: This function should be removed once all targets stop using the conversion intrinsics. Definition at line 233 of file X86.h. Definition at line 1597 of file X86.cpp. References clang::TargetInfo::ConstraintInfo::ConstraintStr, matchAsmCCConstraint(), clang::TargetInfo::ConstraintInfo::setAllowsRegister(), and clang::TargetInfo::ConstraintInfo::setRequiresImmediate(). Definition at line 1552 of file X86.cpp. Definition at line 1516 of file X86.cpp. Definition at line 1464 of file X86.cpp. Validate register name used for global register variables. This function returns true if the register passed in RegName can be used for global register variables on this target. In addition, it returns true in HasSizeMismatch if the size of the register doesn't match the variable size passed in RegSize. Definition at line 161 of file X86.h. Definition at line 1699 of file X86.cpp. Definition at line 1704 of file X86.cpp. Definition at line 1690 of file X86.cpp.